Ottawa Citizen | July 4, 2013. On June 14th, the Canadian government quietly tabled its second report on the human rights impacts of the Canada-Colombia Free Trade Agreement. So quietly, in fact, that even those who had been anticipating its release almost missed it. The report was deposited with the clerk at the end of the day, rather than during routine proceedings in the House. The reporting obligation was enshrined into law in 2010 to address widespread concerns that the FTA would exacerbate the alarming human rights crisis in Colombia. The government has touted the reports as a meaningful way to ensure human rights accountability in trade with the troubled Latin American country. Unfortunately, this latest report’s tone and content — and the quiet way in which it was tabled — seem intent on avoiding scrutiny and leave us wondering what the government is trying to hide. The report’s narrow scope limits itself to an analysis of actions taken under the FTA’s Implementation Act, the act that governs Canadian domestic implementation of the agreement. By interpreting its reporting obligation this way, the government avoids any examination of the impact of Canadian investment — including oil, gas and mining – in Colombia. This arguably defies the very spirit of the exercise. 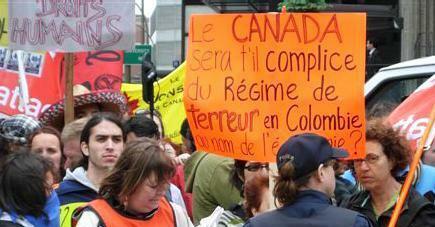 Canadian extractive interests in Colombia were one of the government’s primary motivations for signing the FTA. They were also the most pressing concern voiced by human rights groups worried about the FTA’s impacts. This concern was justifiable and still is: Canadian companies represent over half of Colombia’s mining sector. A May 2013 report issued by the Colombian government’s Comptroller General shows that 80 per cent of human rights violations, 87 per cent of forced displacements, 78 per cent of crimes against unionists, and over 89 per cent of crimes against indigenous people and Afro-Colombians occur in mining and oil-producing regions. These percentages are all the more alarming when one considers the magnitude of these problems: Colombia remains the country with the highest number of internally displaced persons in the world, with 256,590 new cases in 2012. More than one third of Colombia’s Indigenous peoples are threatened with extermination, according to the country’s highest court — a crisis fueled by the violent imposition of megaprojects on indigenous territories. And in 2012, over 280 Colombian trade unionists received death threats and 20 were killed – making it one of the world’s most dangerous places for unionists. Despite the government’s claims that the FTA would improve human rights, labour rights abuses – especially in the oil and gas sector – are still widespread. Last month, two Colombian union leaders visited Canada to denounce violations by Canadian oil company Pacific Rubiales Energy. The company has been accused of union-busting, harsh working conditions, illegal hiring practices, and wages lower than standards set by Colombian labour law and the ILO. There have also been a series of attacks against unionized workers attempting to negotiate with the company. Engaging in resource development in this context carries a high risk of contributing to, or profiting from, these existing human rights and labour violations. Such risk requires the highest standard of due diligence, not only from the corporations involved but also from the governments that promote this investment. Failing to analyze the impacts of the Canadian extractive sector in Colombia shirks this responsibility. Furthermore, due diligence in preparing the human rights report would have required a serious and credible consultation process with stakeholders, including human rights organizations and affected communities. Instead, the government posted a call for submissions on its website and did no outreach – despite having been recently approached by many groups seeking opportunities to provide input. Participants were given 7 working days to respond to the unpublicized call. Not surprisingly, no input was received. The government’s first annual human rights report on the FTA, which came out last year, was a non-report. The government admitted as much but argued that the deal had not been in force long enough to conduct a proper analysis of the FTA’s impacts. Last year’s report did, nonetheless, outline some useful methodological steps for subsequent years. These steps included clustering the economic sectors affected by the FTA (including the extractive sector) and pairing them with relevant human rights analysis. Despite the stated plans, no such analysis was conducted in this year’s report. Instead, the report ends with the simplistic statement that “[...] it is not possible to reach any conclusion on whether any changes in human rights in either country have occurred”. At best, this conclusion suggests that the FTA and its labour and environmental side deals — and Canada’s Americas Strategy more broadly — are not helping to improve the human rights situation in Colombia as promised. At worst, it suggests that our government is consciously turning a blind eye to serious human rights abuses when they benefit Canadian commercial interests. Rachel Warden and Barbara Wood are co-chairs of the Canadian Council for International Co-operation’s Americas Policy Group, a Canadian civil society group focused on development and social justice issues in the Americas. This piece first appeared in Embassy Magazine.